Oooo that heathered swiftly looks nice. I hope they bring it in a SS v-neck or LS version; those are what I prefer. Opal CRB, uh oh I'm going to be in trouble wanting another one. Sorry that this is OT, but does anyone else find that the Go Lightly and Festival bag straps cause piling with CRBs? Any suggestions on which materials won't pil? I love these bags but don't want to ruin my tanks! TIA! @ anon 9:53 am - I think they are Zella Live In Leggings in Purple Beauty Eclipse Spacedye - they're on the nordstrom site right now. She hash tagged her post with Zella and Nordstom. Opal crb: you will be mine! 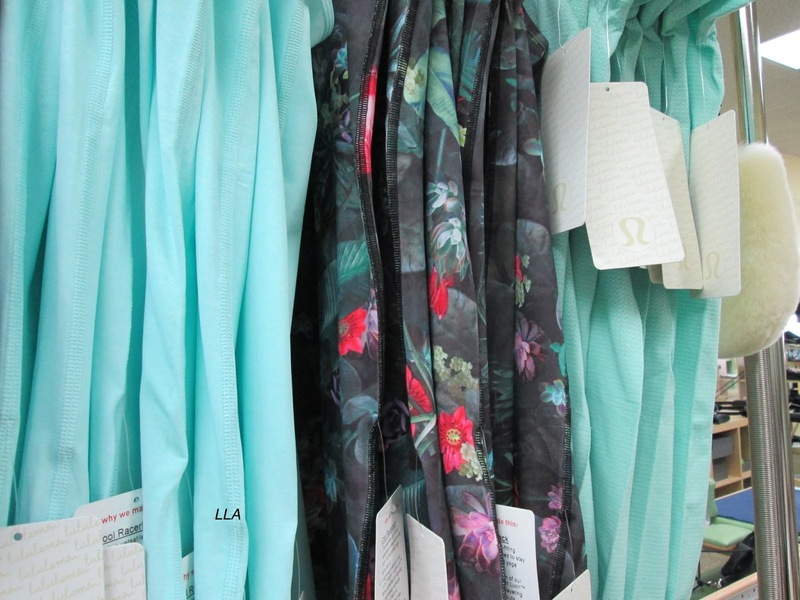 OT, but what is up with lulu increasing WMTM prices?! Free to be bra is $34 instead of $29, and LLA, I know last week you mentioned something about the groovy runs being more expensive too. That is super annoying. I'm interested in the post savasana pullover that just moved to WMTM. Most of the reviews on the LLL website advise to size down but I can't since I'm a 4 and it doesn't come in a 2. My stats are: 5'4", 120 lbs, 32B and petite. Anyone out there with similar stats get this in a 4 that can give me some input as to whether I'll be swimming in it? Thanks. I never tried it on in the store but I remember feeling it and it was divine! Are zella leggings as nice as lulu's in terms of fabric, quality and fit? Anon @ 4:20, I would've been all over this sweater in a 2. I'm a 4 in Lulu wraps and pullovers, and the 4 was big and boxy on me back when I ordered it, so sadly, back it went. For reference, I'm 5'2, 115 and 34D. It's a beautiful sweater, though...my store didn't get them and the eds were all over it. Love the new heathered swiftly! anon @5:49: Zellas feel a bit scratchier and thinner than WUs when you first put them on. I have a pair of space dyes- they are opaque and have gotten super soft in a few washes. IMO the waistband is comfier (feels like a slightly higher rise) with less muffin-topping than WUs. Also OT: anyone know when we can expect the new &go capsule? @ anon 4:20AM - I am 5'4, 110lbs, 32C and usually a 2 or a 4 in lulu tops. The post savasana pullover is incredibly soft and cozy, but in the size 4 I looked like I was wearing a tent. I wouldn't risk it. I wonder how Opal compares with Ivivva's Toothpaste. Anyone know or have pictures? the bruised berry color is going to make my wallet really skinny. I love that color. curious jungle is another one that I am falling for. I just ordered the bang buster in the curious jungle. That's going to be my new running headband for the summer. I found the Zella legging's too thick/warm for me. They're very similar to WU's, which is why I know a lot of people love them, but they're THICK...which I guess is actually better than too sheer, but I was practically sweating just wearing them in the dressing room. They held their shape well, wasn't any sagging or anything. I just can't see myself working out in them or wearing them to hot yoga. I bet they'd be perfect for comfortable airplane travel. at anon 4:20 - I am a solid 6 in LLL tops and bought the post savasana pullover in a 4 and was wondering if I should get a 2! It is most definitely size down. I do love the sweater thought! I hope the heathered bruised berry comes in a SS swiftly V neck! Also would love to know if the jungle CRB is the same as the beachscape (ie. full on polyester!). Wammo camo wunder under pants are on the website available in sizes 8 and 10 if the site is accurate. Vote for longer return policy! LLA - off topic question.. was the bali breeze DSJ only released in australia? what about canada, USA? thanks in advance! @ Stephanie - I honestly don't love them as much. I feel like they're a bit thicker and are just a bit more restrictive then WU pants, and it makes them too hot for me to enjoy wearing them. I did hear once from a Nordstrom sales girl though that an old designer from LLL went to Nordstrom and now designs for them, so that could be why their stuff looks so similar (WAFS is almost identical to their line) - but honestly Nordstrom has a really good return policy so you can always try the pants them return them if you don't like how they perform. I'm really particular to only wearing LLL pants for working out (I find other brands don't work as well for what I like) but I just scooped up some Old Navy crops on their sale because a girl at my gym was wearing them and they are SO cute. Plus for $19/crop it's worth a try. Also @ Lauren F., I totally agree about WMTM being so high priced...it doesn't feel like such a sale and at final sale restrictions I find myself not being swayed by the stuff on there that often. toothpaste is a light blue, opal is a light green. i can take a photo if you like. To me the CRB & swiftly look like Angel Blue not Opal. Hi OT, but I'm also looking for sizing advice on the Post Savasana Pullover. I'm 5'5, 130-135, 34C. I'm a 6 in tops without built in bras, and I take an 8 in most LLL bras. I found an old post where LLA did a PSP fit review and said she would stick to her TTS. Should I take my tts 6 or size down to a 4?? TIA, any and all advice is appreciated! Anon 4:20 here - thanks all for the advice!! You guys are great and so helpful. I think I'm going to hold off because I probably will feel like I'm wearing a tent! Why should customers have to vote for a longer return policy? That's idiotic. LLL is behind the times on the return window. Just do it already for goodness sake. @ 1:01 PM, I know, here opal looks like angel blue but in another photo it looks green and like bali breeze. When to my SSP today. Came home with the heathered BB swiftly SS. Gorgeous. The SG CRB is gorgeous too. Sadly they did not have my size. I will get it online. The CRB and 105 singlet are aquamarine while the swiftlys are heathered opal. The swiftly colour is way too close to angel blue to warrant a purchase. Love the blog. Thanks for all the hard work.